The Lhasa Apso originated in Tibet in the Himalayan Mountains hundreds of years ago. It's named after the sacred city of Lhasa. For years the breed remained solely bred in Tibet by holy men and nobles. 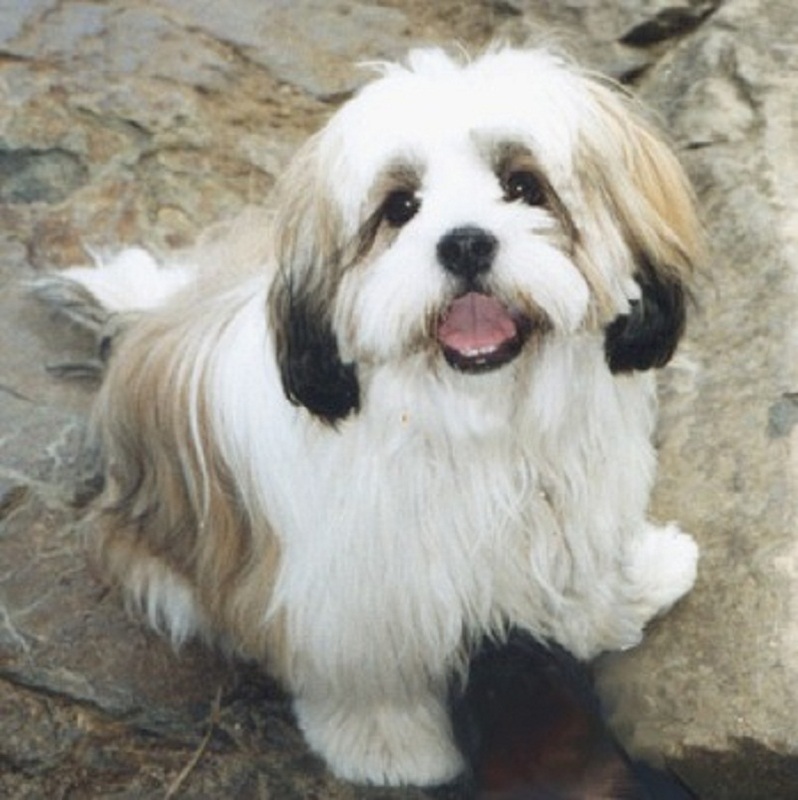 The Lhasa Apso is the most popular breed indigenous to Tibet. Sometimes they are known as the Tibetan Apso. The name "Apso" means goat like and long hair. In Tibet Lhasa Apso's are a treasured dog of the privileged. The Lhasa Apso made wonderful guardians as well as loyal companions. They were the only breed in Tibet owned by the holy men and the nobles. They were used as watch dogs in the temples and monasteries. The people of Tibet greatly respected these little dogs. They were never sold or bought but given as gifts and it was considered a great honor to receive one. The Lhasa Apso was once known as the Lhasa Terrier and was developed/created 800 years ago. The Lhasa Apso is called the Abso Seng Kyi or bark lion sentinel dog in it's home land where Tibetans favor a fail safe security system. The Lhasa Apso first appeared in the western world in 1901 when Mrs. McClearan Morrison returned to England with several of these little dogs. It was used as a watchdog in temples and monasteries. This breed was considered sacred. The belief was that when its master died the master's soul entered the Lhasa Apso's body. Lhasa's were not easy to come across and were hard to buy. The dogs were considered good luck to their owners. In 1933 the dogs spread to other parts of the world thanks to C. Suydam Cutting, who introduced the first Lhasas to the USA as gifts from the 13th Dalai Lama. Tibet's ruler would present them to visiting foreign diplomats. The Lhasa Apso first appeared in Britain in the 1920s and in the USA in 1930. •	The Lhasa Apso personality is one of a happy, mischievous, and playful dog. •	Lhasa’s are regal, independent, and fierce. •	Have an independent streak, therefore, do well if left alone for short periods of time. Not known to suffer from separation anxiety like most other breeds. •	Lhasa’s maybe be small, but this sturdy, strong guy makes a good watchdog, will notice and bark at anything amiss. •	Wary of strangers, takes time to ‘warm’ up to your friends. •	Independent personality, Lhasas like to be "top dog." Training and socialization, beginning with puppy classes, are essential. •	You need to be a strong, kind leader. •	Doesn't need a lot of exercise, not extremely active breed, content living indoors. •	A healthy breed in general, but can develop eye problems and allergies. •	Great apartment dog, loves being a ‘lap’ dog. •	Low shedders, good hypo-allergenic choice. Regular grooming is necessary for this breed that has a gorgeous silky coat that is easy to care for. The Lhasa Apso is gentle, happy, outgoing and devoted little dog. It has a bold temperament and is playful and affectionate which makes for a lively and friendly companion for other pets, children or elderly folk. Lhasa's are very people oriented and does not like to be left alone for long periods of time. A favorite pastime of the Lhasa Apso would be quietly napping next to its owner. Though it is a very regal looking species, its character is tough and ever so hardy. Although the Lhasa Apso is courageous and adaptable, it does not like rough handling or loud harsh words. Lhasa Apso's are timid yet can be assertive and strong willed with minds of their own. They are very intelligent, quite sensitive and do not respond well to raised voices which can cause them to be depressed. Their intelligence scores them many points during training as they seem to live to please their owners. Having been bred to be watch dogs, Lhasa Apso's tend to be alert and have a keen sense of hearing with a rich, sonorous bark that is deceptive of their size. They must not be overly spoiled as they may develop behavioral problems. The Lhasa is in a class of it's own when it comes to showing devotion towards a loving, gentle and firm but kind owner. Although they can be obstinate, they are forever loyal. The Lhasa is calm in nature and makes a wonderful lap dog for all ages and allows it ample enjoyment during traveling. In its moods of playfulness, they can be quite entertaining an very enjoyable. The Lhasa Apso sheds minimally and is a very good choice for those with allergies or asthmatic symptoms They are of high maintenance and require a minimum of bi-weekly brushing or combing. Their thick undercoat may become matted or tangled if not properly groomed on a regular basis. Specific areas this happens most often is with the hair behind the ears as it is usually softer . It is vital to pay special attention to extra hair on the bottoms of their feet and in their ears. These areas need to be kept meticulously clean and free of any excessive hair in order to avoid unnecessary ear infections or sores between their toes around the pads of their feet. It is just as important to keep the Lhasa's eyes void of excessive hair as this will ensure the eyes stay clear and fully vibrant. When some of their hair goes over their eyes the Lhasa Apso's eyelashes are long and strong enough to allow the dog to see very well. It is best to start getting the Lhasa used to being groomed when it is very young. This way, it will have the patience it needs to be still and quiet for long periods of time while being groomed. If Lhasa Apso's are not kept properly groomed they can develop skin problems. Regular bathing is important but do not over bathe. The Lhasa Apso has glands that secrete a natural oil which coats the surface of the skin and keeps it supple and moist. Periodic trips to the groomers for a pet clip will keep the Lhasa's coat manageable while still allowing the original characteristics of the breed to be enjoyed. If you own a Lhasa as a pet and do not show it, keeping your dog in a puppy cut or teddy bear clip is highly recommended. Lhasa Apso's have a moderate energy level so they do not demand a lot of exercise. Regular exercise will keep them fit, trim and healthy. Although they love to walk and scamper about, they equally enjoy regular opportunities to run free and play. Fetch is an excellent way to play with your Lhasa while providing it with daily exercise. The Lhasa Apso can play indoors thus meeting its exercise needs while having fun. However, they do benefit from outdoor adventures such as a daily walk. Large yards are not necessary as the Lhasa apso tends to occupy small spaces at any given time and can do so while being very content. The Lhasa Apso learns best with patience and calm words. It is important to establish a relationship of mutual respect for instance admiring his independent character while consistently enforcing your rules so that he respects you as well. Because the Lhasa Apso is strong willed with a mind of his own it requires a confident owner who can take charge. Training methods that emphasize food and praise will be met with much more cooperation. The Lhasa Apso can be manipulative and a challenge to train but is highly intelligent so it can learn very quickly. Forcing it to do things without positive reinforcement or rewards usually do not prove to be successful. Remember to respect their instinct of being wary of strangers though. Be careful when introducing them to new people a to not overwhelm them with too much at one time. A wonderful session of training includes a visit to the veterinarian and groomer introducing the harness or collar and leash. Crate training can be successfully achieved if the crate is introduced to the Lhasa puppy at an early age. Taking the gate off the front makes for a wonderfully, safe and secure hideout. Here is where it learns to be comfortable in its crate and knows it will come out sometime after going in. Overall training can be a very fun and rewarding time for you and your Lhasa Apso.